Popiah is a type of spring roll found throughout Malaysia, and translates as ‘thin wafer’. This refers to the outer wrappers, which are traditionally made from wheat flour – but these rice-based ones also work perfectly. The filling is usually a combination of vegetables, meat or prawns. Chicken and beef strips work well too. 1. Cook the beans in boiling water for 3 minutes. Drain and cut each bean into 3. 2. Heat the oil in a frying pan, and fry the tofu gently for 2-3 minutes. Remove with a slotted spoon and set aside. Add the prawns, shrimps, galangal paste, salad onions and beans, and cook for a further 1-2 minutes. Stir in 2 tbsp kicap manis, and the reserved tofu. Take the pan off the heat and allow the contents to cool slightly. 3. 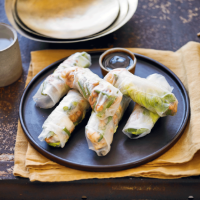 Dip the spring roll wrappers in cold water for a few seconds and lay on a damp, flat work surface for 1 minute to soften. Place a lettuce leaf on each, top with the prawn filling and sprinkle with fried onions. Fold over 2 edges of the wrapper, then roll up tight to enclose the filling. 4. Mix the remaining kicap manis with soy sauce, and serve as a dip with the popiah.